Step right up to experience the whirlwind! Players scroll the crystal ball and attempt to stop it on their chosen number. 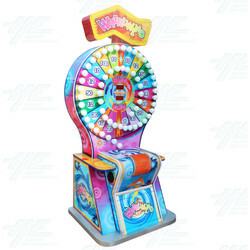 When the ball is spun, coloured lights spin around the board and create the illusion of a whirlwind. But don't spin it too fast or you'll create unnecessary error. The 9 rings stand for 9 different scores, and players must attempt to gain the highest score possible. Step right up to experience the whirlwind! Players scroll the crystal ball and attempt to stop it on their chosen number. When the ball is spun, coloured lights spin around the board and create the illusion of a whirlwind. But don't spin it too fast or you'll create unnecessary error. The 9 rings stand for 9 different scores, and players must attempt to gain the highest score possible.